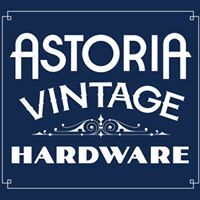 With preservation being a core value, the furniture builder and upholsterer united and proudly introduce Astoria Vintage Hardware Architectural Salvage and Home Furnishings. The source for re-purposed and reclaimed treasures for your home and garden: antique doors, hardware, windows, molding, bath and light fixtures, artifacts, etc. blended with custom creations from their personal studios, My Grandfather’s Nails and Savannah House.